Go to original pattern for design DROPS 147-41. Plaited DROPS necklace and bracelet with crochet summer flowers in ”Safran”. 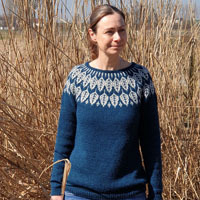 You can get the yarn to make this pattern from	11.50£. Read more. Make a plait as explained below and place it tog into a necklace. 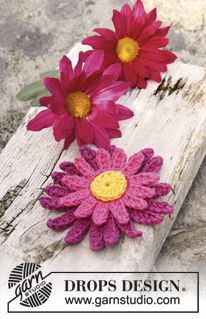 Then crochet flowers as explained below. 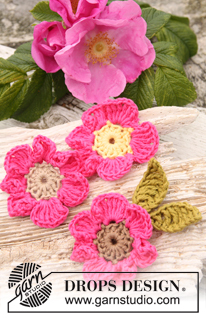 Sew the flowers on to plait where wanted (see picture – model on picture has 2 Marguerite flowers, 1 large dahlia flower, 1 briar rose, 2 potentilla flowers, 1 kalanchoe flower and 1 leaf). Cut 18 threads off white of 150 cm and place them tog. Take a new thread and wrap it tightly around these 18 threads, approx. 40 cm in from the end, fasten the thread tightly (the 18 threads have now been locked). Divide the long threads for plait in 3 parts with 6 threads in each part and plait a classic plait until approx. 40 cm thread remain. 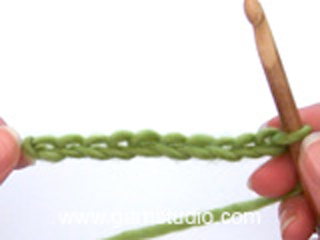 Take a new thread and wrap it tightly around the end of plait the same way as on beg, fasten the thread tightly. 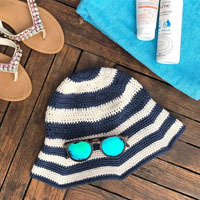 Make a loop with the plait that is big enough to pull over the head and fasten the plait tog at the front by tightly wrapping a thread around the same way as on the ends. Cut the thread ends to desired length (the entire length on threads have been kept on the picture). Worked in the round. 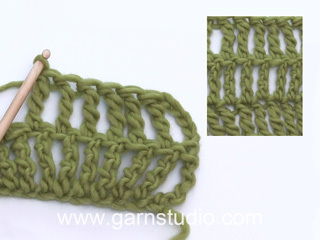 Crochet 5 ch on hook size 3 mm with lime and form a ring with 1 sl st in first ch. ROUND 1: 3 ch (= 1 tr), work 15 tr in ch-ring, switch to orange or strong yellow and finish with 1 sl st in 3rd ch from beg of round = 16 tr. ROUND 2: * 7 ch, work back in ch-row as follows: Beg in 2nd ch from hook and work 1 dc, in each of the next ch work: 1 tr, 1 dtr, 1 dtr, 1 tr and 1 dc. Work 1 sl st in next tr *, repeat from *-* 15 more times (= 16 times in total) and finish with 1 sl st in 1st ch from beg of round = 16 leaves. Cut and fasten the threads. Worked in the round. Crochet 5 ch on hook size 3 mm with strong yellow and form a ring with 1 sl st in first ch. ROUND 1: 3 ch (= 1 tr), work 15 tr in ch-ring, switch to dark heather and finish with 1 sl st in 3rd ch from beg of round = 16 tr. ROUND 2: 1 ch, * in next tr work as follows: 1 dc, work 7 ch and work back in ch-row as follows: Beg in 2nd ch from hook and work 1 dc in each of the next 6 ch *, repeat from *-* 15 more times (= 16 times in total) and finish with 1 sl st in first dc from beg of round = 16 leaves. Cut and fasten the thread. Worked in the round. Crochet 5 ch on hook size 3 mm with yellow and form a ring with 1 sl st in first ch. ROUND 1: 2 ch (= 1 htr), work 13 htr in ch-ring and finish with 1 sl st in 2nd ch from beg of round = 14 htr. ROUND 2: * 3 ch, skip 1 htr, 1 sl st in next htr *, repeat from *-* 6 more times (= 7 times in total) but switch to cerise when last sl st remains and finish with 1 sl st in first ch from beg of round = 7 ch-loops. ROUND 3: 1 ch, in every ch-loop work: 1 dc, 2 ch, 3 dtr, 1 ch, 3 dtr and 4 ch. Finish round with 1 sl st in first ch from beg of round = 7 leaves. Cut and fasten the thread. Worked in the round. 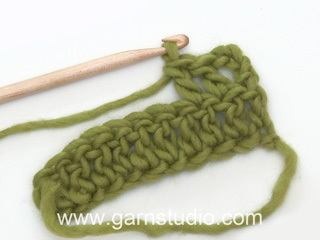 Crochet 4 ch on hook size 3 mm with brown and form a ring with 1 sl st in first ch. ROUND 1: 1 ch, * 1 dc in ch-ring, 2 ch *, repeat from *-* 4 more times (= 5 times in total), switch to strong yellow and work 1 sl st in first ch from beg of round = 5 ch-loops. ROUND 2: 1 ch, in every ch-loop work: 1 dc, 1 ch, 2 tr, 2 ch, 2 tr, 1 ch, 1 dc. Finish round with 1 sl st in first ch from beg of round = 5 leaves. Cut and fasten the threads. Worked in the round. 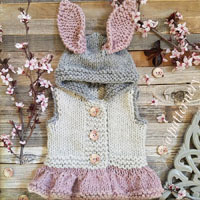 Crochet 3 ch on hook size 3 mm with medium pink and form a ring with 1 sl st in first ch. ROUND 1: 1 ch, work 6 dc in ch-ring and finish with 1 sl st in first ch from beg of round. ROUND 2: 1 ch, * 1 dc in next dc, 3 ch, 1 htr in 3rd ch from hook, 1 tr in same ch *, repeat from *-* the entire round and finish with 1 sl st in first ch from beg of round = 6 leaves. ROUND 3: 1 ch, turn piece and work from the back of flower, * work 1 dc in next dc from previous round, 3 ch *, repeat from *-* 5 more times (= 6 times in total) and finish with 1 sl st in ch from beg of round = 6 loops. ROUND 4: 1 ch, turn piece and work from the front of flower, * 1 dc in ch-loop, 3 ch, work 1 htr in 3rd ch from hook, 1 dc in same ch-loop, 3 ch, work 1 htr in 3rd ch from hook, move to next ch-loop *, repeat from *-* 5 more times (= 6 times in total) and finish with 1 sl st in first ch from beg of round = 12 leaves. Cut and fasten the thread. Worked back and forth. 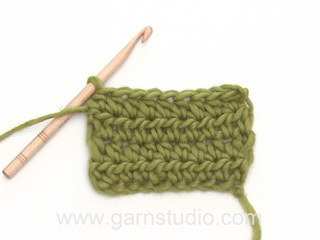 * Work 10 ch on hook size 3 mm with army green. Work back in ch-row as follows: 1 dc in 2nd ch from hook, 1 ch, 1 tr in next ch, 1 ch, 1 dtr in next ch, 1 triple tr in each of the next 2 ch, 1 dtr in next ch, 1 tr in next ch, 1 ch, 1 htr in next ch, 1 sl st in last ch *, repeat from *-* one more time = 2 leaves. Cut and fasten the thread. 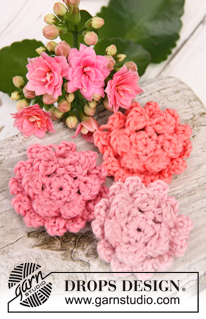 Crochet 2 flowers as explained below. Sew the flowers tog with a couple of stitches so that the small dahlia flower is somewhat on top of the potentilla flower. Work 1 ch-row that measures approx. 30-35 cm. Cut and fasten the thread in both ends. Work another ch-row the same way. Pull one ch-row through a st at the back of the dahlia flower. Pull the other ch-row through a st at the back of the potentilla flower. Each ch-row now lies double and function as a tie. 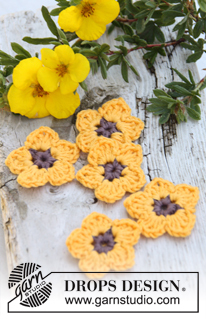 Crochet 4 ch on hook size 3 mm with strong yellow and form a ring with 1 sl st in first ch. ROUND 1: 3 ch (= 1 tr), work 11 tr in ch-ring, switch to cerise and finish with 1 sl st in 3rd ch from beg of round = 12 tr. ROUND 2: 1 ch, * in next tr work as follows: 1 dc, work 5 ch and work back in ch-row as follows: Beg in 2nd ch from hook and work 1 dc in each of the next 4 ch *, repeat from *-* 11 more times (= 12 times in total) and finish with 1 sl st in first dc from beg of round = 12 leaves. Cut and fasten the thread. POTENTILLA FLOWER – see explanation below necklace. Jällegi väga armas element,annab tooni ja energilusust,samas nii vaba aja kui ka miks mitte ka suvisel pidustusel kanda.Väga meeldib.Tänan. Der Sommer grüßt. Einfach schön. Pretty and colourful. Name idea - Fleur.